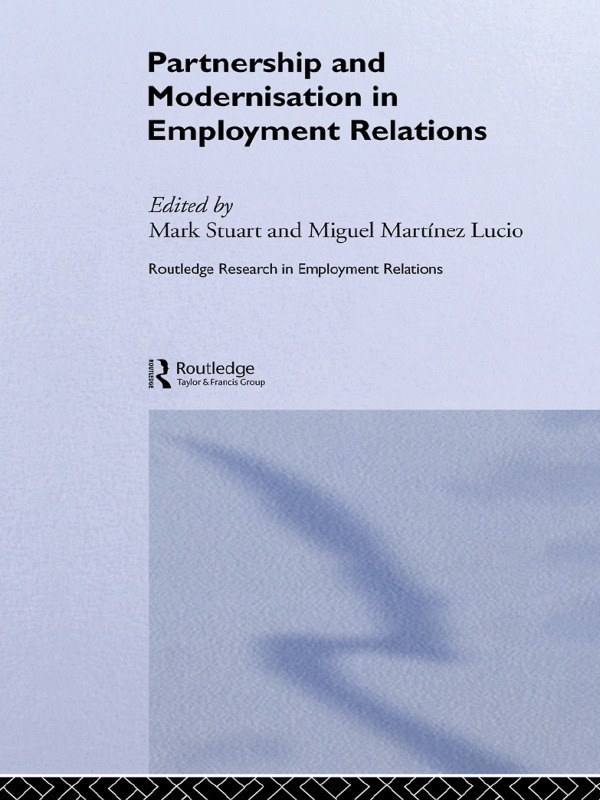 This collection examines the significance of partnership-based approaches to the modernization of employment relations. Drawing from the work of leading researchers the contemporary interest in partnership is situated within an historical, political and practical context. Particular attention is given to exploring and understanding the practices and experiences of partnership at the workplace. 1. Partnership and the Modernisation of Employment Relations: An Introduction 2. Partnership and Voice, With or Without Trade Unions: Changing UK Management Approaches to Organisational Participation 3. Assessing Partnership Approaches to Lifelong Learning: 'A New and Modern Role for Trade Unions'? 4. Working Corporations: Corporate Governance and Innovation in Labour-Management Partnerships in Britain 5. Developing Partnership Relationships: A Case of Leveraging Power 6. Trade Union Representatives’ Attitudes and Experiences of the Principles and Practices of Partnership 7. Management and Union Motives in the Negotiation of Partnership: A Case Study of Process and Outcome at an Engineering Company 8. The Promotion and Prospects of Partnership at Inland Revenue: Employer and Union Hand in Hand? 9. Breaking with, and Breaking, ‘Partnership’: The Case of the Postal Workers and Royal Mail in Britain 10. Seeking Partnership for the Contingent Workforce 11. Social Partnership Agreements in Britain 12. Employees’ Experiences of Workplace Partnership in the Private and Public Sector 13. Workplace Partnership and the Search for Dual Commitment 14. Whose (Social) Partnership 15. Where Next for Partnership?